This healthy, vegetarian twist on the classic chicken parmesan will have you fueling up with lighter fare! Eggplant is a hearty vegetable that will fill you up with fiber and plenty of vitamins and minerals. Add sauce and cheese you and you will be eating a decadent Italian dish that tastes fresh, whole and hearty, without overdoing it on carbs or saturated fat. 2. Spray nonstick vegetable oil cooking spray on medium or large, non-stick pan and add olive oil. Warm over medium heat. 3. Add eggplant slices and cook until browned (about 5-7 minutes on each side). While eggplant is cooking, preheat oven to 350 degrees F.
4. Remove eggplant slices from pan once cooked and place on plate covered with paper towel to drain excess oil. Spray casserole dish with nonstick vegetable oil cooking spray. 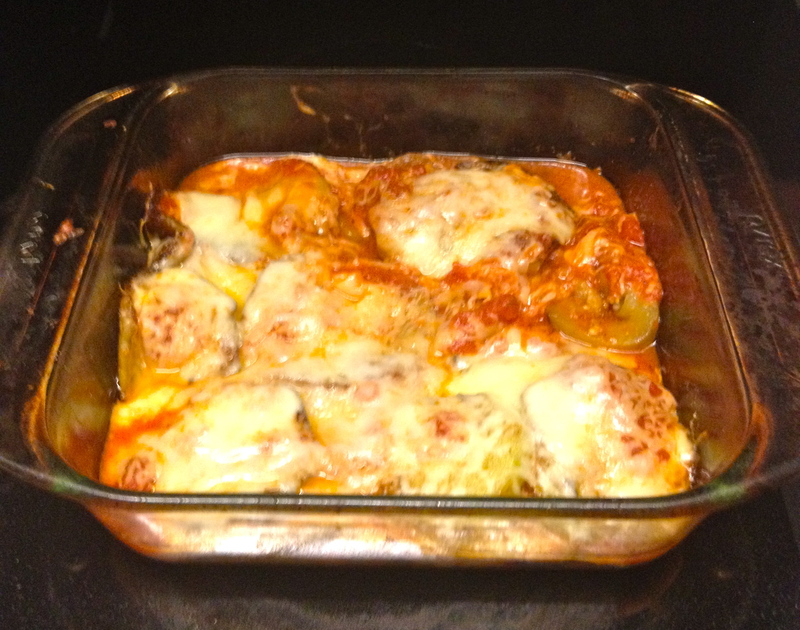 Layer eggplant with sauce and cheese on top and repeat as necessary, depending on size of casserole dish. 5. Bake in oven until cheese is melted, approximately 10 minutes. Serve hot and enjoy! A Healthy Game Day Menu That Is Sure To Score! Game day usually means super sized portions, fried, greasy food, heavy dips, beer and a whole lot of couch sitting. Don’t let cheering on your team mean falling into these common traps. 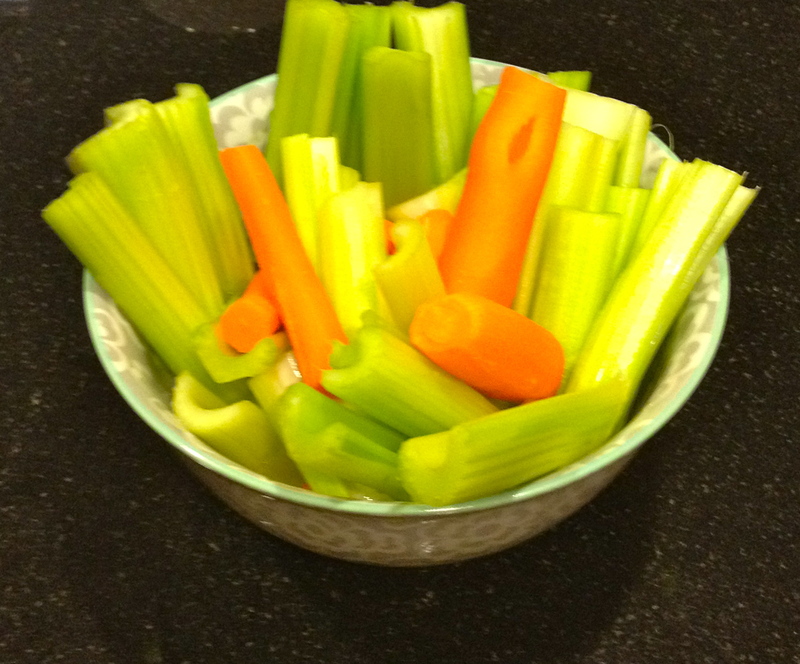 Defend your right to eat healthfully and serve up some grub that is sure to score this Superbowl Sunday! Baked chicken breast with hot sauce has all the taste of hot wings without all of the fat! Fuel up with protein and hot sauce and resist the urge to to overeat – lean protein will leave you feeling satiated, so you won’t feel the need to reach for extra snacks. Also, some research suggests that eating hot, spicy foods cuts food intake. Simply marinate chicken breasts in Tabasco sauce (approximately 2-3 Tbsp per 16 oz. of chicken breast depending on how spicy you like it) on a baking sheet lined with parchment paper and bake at 350 degrees for approximately 25 minutes, or until cooked through. 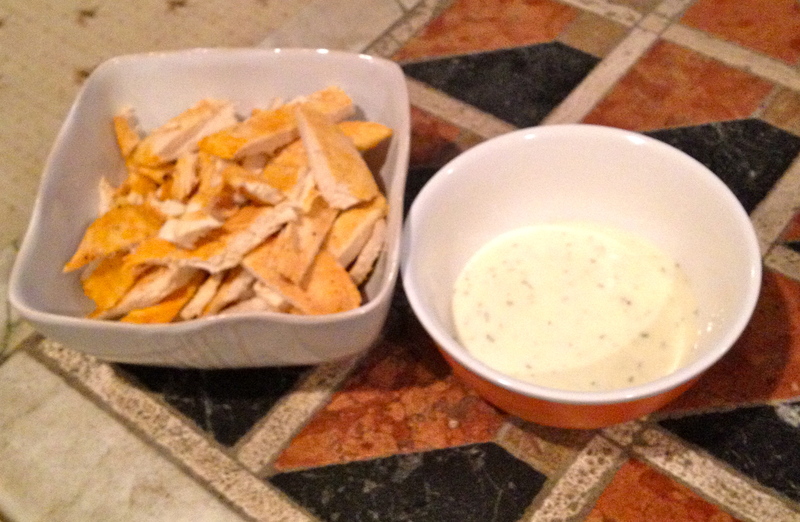 Cut into easy-to-eat strips and serve with ranch or blue cheese dressing, or enjoy plain! Serve with light beer to cut the spice and keep calories in check. 1. Cut each avocado in half, lengthwise. Remove large pit from each avocado. Remove inside of avocado with spoon and place in large bowl. Discard skin of avocado. 3. Dice red onion. Add to bowl with avocado. 4. Dice tomato. Add to bowl. 5. Remove seeds and wash jalepeno pepper. Mince pepper and add to bowl. Mix all ingredients together. 6. 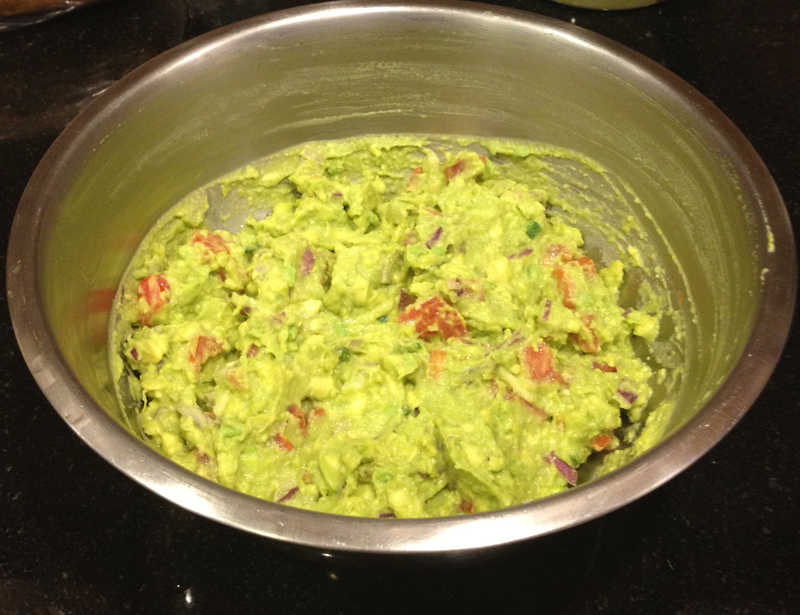 Add salt and squeeze the juice of 1/2 a lime over guacamole. Mix and chill until cold (approximately 20 minutes or longer). Enjoy! Substitute Greek yogurt for sour cream in recipes such as onion dip, spinach and artichoke dip, or any other creamy dip you desire! Greek yogurt contains less fat and more protein than sour cream, but offers a tangy, creamy taste so your friends won’t even notice the difference. 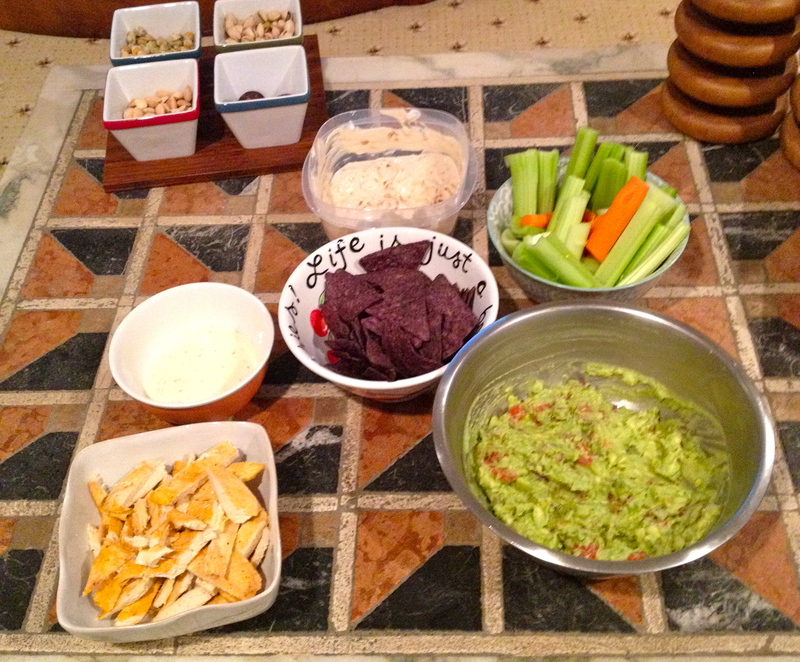 Use crudite to scoop up the guac and the Greek yogurt dips, or substitute chips for baked chips, which contain less fat. These tricks will help you to fill up with protein and fiber, while cutting back on unwanted fat! Celebrate your team with a sweet taste of dessert, but don’t fear that has to mean sabotaging your healthy day. Some tips? Make brownies by substituting either applesauce or Greek yogurt for canola oil. Offer a fresh fruit salad, cut up dark chocolate bark, or make a dark chocolate fondu and use strawberries, bananas and other fruits to scoop up the chocolate-y goodness! Also, keep healthy grab-able snacks out throughout the day, such as almonds, pistachios or other nuts so guests can nibble without the fear of extra jiggle! Don’t let game day food stress you out – relax and enjoy the day with these healthy tips that are sure to score major points with your fellow fans!